Accommodating simultaneous use of up to 3 tools on 2 spindles, TRAUB TNL18 can be changed over in minutes to produce precision parts with or without guide bush for long/short parts from bar up to 20 mm dia. 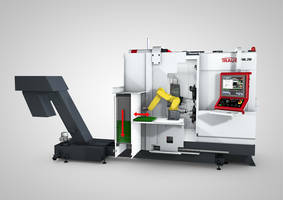 It delivers precision and qualified surface finish in one operation, and tool capacity can be increased to 54 places via dual- and multi-holders. 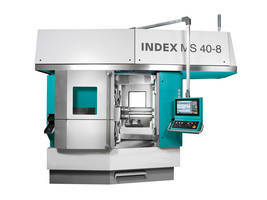 Also available, TNL18P production machine features Y-axis motion of upper turret mapped by interpolation of X/C/H axes. 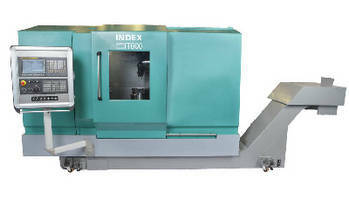 INDEX Corporation at IMTS 2010, Booth S-8136, will present the new TRAUB TNL18 sliding headstock automatic lathe and its variant, the TNL18P production machine. The TNL18 can be changed over in minutes to produce precision parts with or without a guide bush for long or short parts from bar up to 20mm diameter. Up to three tools can be on the part at once. The machines are ideal for medical component machining, delivering precision and qualified surface finish in a single operation. The tool capacity of the TNL18 can be increased to as many as 54 tool places through dual- and multi-holders, extending productive times. 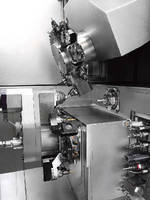 The high-precision, fast turret indexing enables a very fast chip-to-chip time of 0.3 s. Both variants make use of the new TRAUB compact shaft system: an improved system for high-precision mounting of tool holders in the turret. 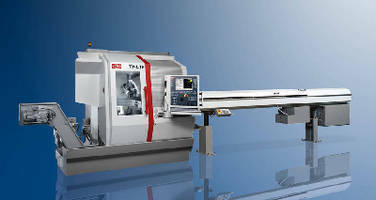 According to an INDEX spokesman, "With the sliding headstock automatic lathe TNL18 and its variant, the TNL18P production machine, TRAUB is expanding its broad portfolio to include two powerful and versatile machines. The P variant caters especially to customers looking for the optimum in price and technology without giving up the familiar comprehensive machining options for maximum productivity. The enhanced TNL18 variant is equipped with a few more features than the P variant." The lathe can quickly be changed over for use with and without a guide bush for long or short parts. The extremely long Z-travel distance of the headstock ensures the proper positioning of the main spindle, either for turning with a guide bush or without. In the standard design, the powerful main spindle is equipped with a C-axis and provided with either a direct drive with high dynamic response or a belt drive (TNL18P) and high torque in order to achieve large cutting volumes.